Toyota Nation Forum : Toyota Car and Truck Forums > Toyota Passenger and Sports Car Forums > Camry and Solara Forum > Camry 5th & 6th Gen (2002-2006 & 2007-2011)/2nd Gen Solara (2004-2008) > My next thing to do!! My front brakes are pretty much done, my steering pulsates when stopping hard ,definatly warped rotors and the pads are pretty thin. 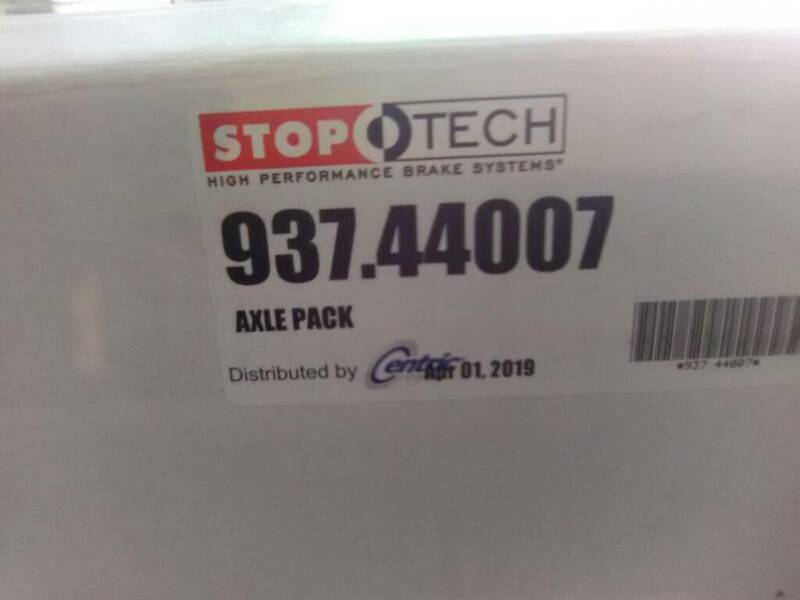 So next week I will be installing Stop Tech Slotted Rotors and Stop Tech Pads. 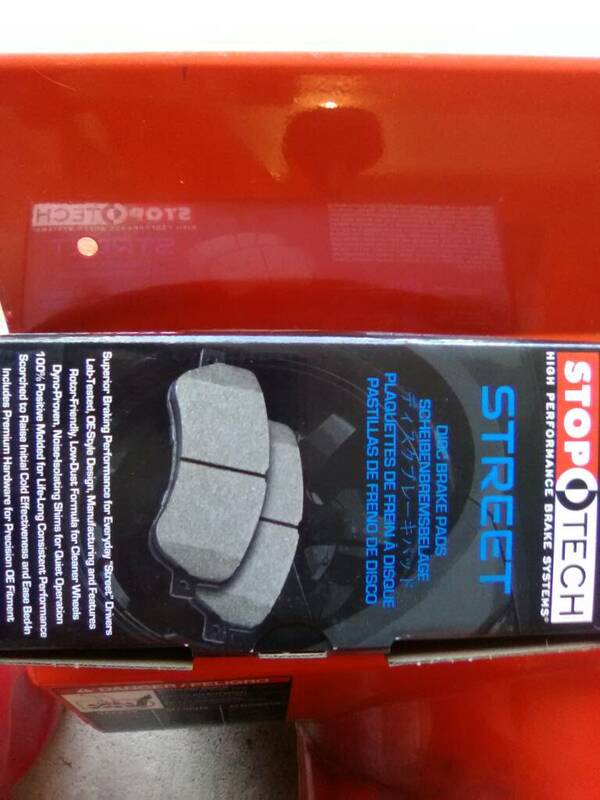 The Stop Tech Street Pads are equivalent to the Posi Quiet Pads. I got these from Carid. I did my rears already with the same rotors and pads. I called them 1st and the lady sent me a 5% off coupon via email which are thought was very nice. I have heard good things about this set up and must be made by Centric. Any one who has these lem me know how you like them. I just put on front rotors as well. Made a big difference. I went simple with NAPA, no slotted or drilled. Feels good, no more steering wheel shake. Some day I'll use a higher end pad. My brake pedal would go down almost to the floor,I noticed a burning metal / ceramic smell. I also noticed that when I go over bumps, I get a shudder like noise from my front end, I checked the Front sway bar end links and I could move them side to side with ease and move them slightly up and down, so I bought some moog replacements, So I am going to do those as well. I guess my car is getting a well needed spring refresh lol, new dashboard, new pads and rotors and new sway bar end links. It should ride very nice when everything is done. Is there a topic that points exactly where the sway bar end links you speak of(on the car?) i was wondering if you got a part number for both sides. I bought the MOOG Part number K750123. I tried to take mine off today after soaking them with pb blaster and broke my ratchet wrench, I think that I am going to need an impact wrench, I don't own one but my have to buy one. I also have a reciprocating saw if I have to cut it off. Last edited by glenn14; 04-13-2019 at 05:23 PM. Cut it or burn it if you don't got an impact. Since I live in the Northeast ,Boston Ma. Area, we get a lot of snow and ice, there for they salt the roads quite often, so the bolts are rusted badly. I broke a ratchet so bad it just spins around. I don't have a torch, so I'll have to cut it. The space is very tight. I don't know if I can get my reciprocating saw in there, I wonder if a dremel would work ?? An air impact, or at least a corded/battery one is a must for the toolbox. A good 250+ torque air impact wrench really gets some bad mofos loose!
. I don't know if I can get my reciprocating saw in there, I wonder if a dremel would work ?? I successfully used a Dremel with a cutoff wheel on mine. It took a while but it did work. I agree 100%. I just bought a new house in September of 2018. I don't have the funds for and air compressor and air impact, but have been looking at either a corded or battery one. Advanced auto has a Porter Cable PCE211 corded one for $99.99 and a 10 pc set of metric deep sockets for 19.99. If I by online for all in store pick up with in 30 minutes I can get a 20% coupon or 25% coupon. IIRC its rated at 450 torque. So I could get them both for 95.98 + tax at 20% off or $89.98 25% off + tax which is a great deal. And heard the the Porter Cable is made by DeWalt. I don't know how true that is. I have also looked at the battery ones at Lowes and Home Depot and at Harbor Freight , The impacts seem to start at about $100 without the battery's and charger. Its pouring rain up here today and my garage is still filled with moving boxes of stuff so I can't get my car into the garage so I can't do anything today. I will shop around and pull the trigger on something that I can afford today so I can be ready tomorrow to start. I have to do my front rotors and pads and my front sway bar end links, they are the original OEM and are dripping grease like crazy so I am going to do everything at once. After trying to remove the end link bolts, I knew I needed to invest in an impact wrench. Last edited by glenn14; 04-15-2019 at 11:19 AM. Last edited by glenn14; 04-15-2019 at 09:11 AM. Ugh. We bought a 1997 CR-V that was our daugher's first vehicle. It had a sway bar that was pretty much exactly like that and nothing I could do could free it. It busted a brand new LBJ one day when she was driving it, and the best I could do was have it towed to a family memvber's driveway that lived in that city. This meant I did not have my tools like air compressor and all that. All I had was a socket and a wrench. I cut the damn thing out with an angle grinder so I could free up the knuckle and replace the LBJ. Sometimes the Nuclear Option is the only option. Thank you for the laugh, I watched the video, as a matter of fact I watch aliens on AMC about a week ago Lol !!! Well, yesterday, I got my Stoptech slotted rotors and pads installed plus my Moog front sway bar links installed. A friend of the family, owns a shop with a lift and is a ASE certified mechanic. I told him what I was doing so he said bring your car down and we'll get this done ,I'll help you out, so in an hour and a half everything got done. He used his air impact wrench to get every stuck bolt off, I did soak them for 2 days with PB Blaster so I am sure that helped. Today I am going to wash the car ,drive it up on my ramps and clean sand and paint under there to get rid of some rust. Brakes work great. Nice peddle feel and no more knocking noise / shuddering noise from the front end due to bad sway bar links. My Camry rides like a new car. Pic. 1& 2 new Moog links. 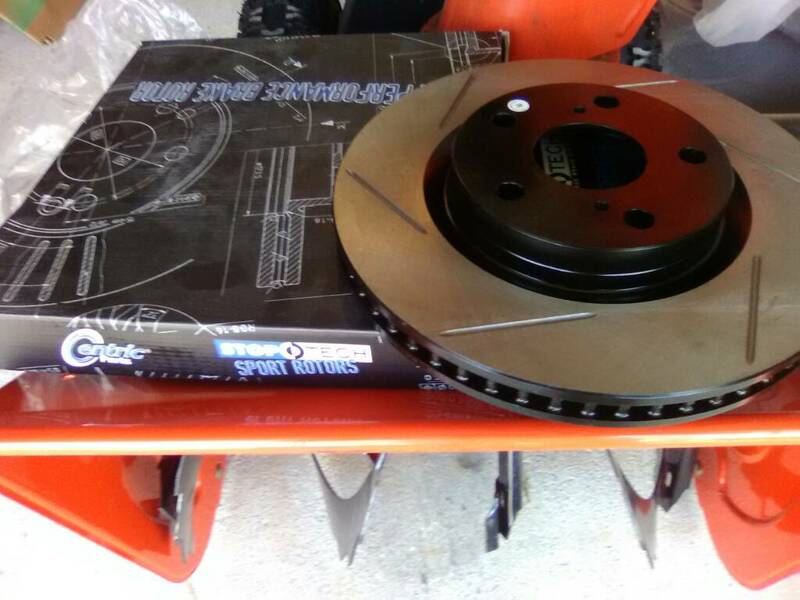 Pic 3 new Stop tech Rotors and pads. Last edited by glenn14; 04-17-2019 at 10:17 AM.